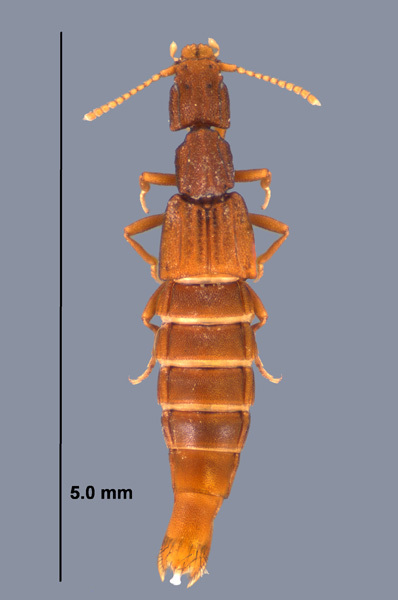 The genus Myrmecosaurus (Staphylinidae: Paederinae) includes 7 described species, all from South America and all associated with Solenopsis spp. (Formicidae). This genus was first reported in the United States from Georgia and Mississippi by Collins and Markin (1971). In their study, they collected 100 individuals from nests of Solenopsis richteri Forel from various localities, but specimens were not identified to species. Frank (1977) later found Myrmecosaurus ferrugineus Bruch (Figure 1) in nests of S. invicta Buren in Alabama, Florida, and Louisiana. Lago (1997) reported the collection of a single specimen of this beetle from Point Clear Island, Hancock County, Mississippi, however his specimen was collected under bark of Magnolia grandifolia L. (Magnoliaceae) in association with ants (the species of ant was not indicated). Tschinkel (1992) reported observations of Myrmecosaurus sp. following raiding trails of S. invicta and even entering an incipient nest on one occasion. On 6 February 2005 a single specimen of M. ferrugineus was collected from a mound of the imported fire ant hybrid, S. invicta X richteri, in the Sessums Community, in Starkville, Oktibbeha County, Mississippi. Collecting other arthropods from fire ant mounds can be tricky due to the extremely aggressive behavior of fire ants. However, it is relatively easy to make collections in cooler times of the year when the fire ants are much less active. The temperature at the time of this collection was approximately 5° C. The collection was made by taking small shovels-full of soil from the center of a fire ant mound approximately 0.5 m in height. The soil was then transferred it to a shallow white pan where it was scanned for other insects. The single specimen of M. ferrugineus collected was found near the top of the mound in the first shovel of soil and no further beetles were seen even though much of the mound was searched. Other collections M. ferrugineus were reported to have been in nests of both S. invicta and S. richteri, whereas this collection was from a mound of the hybrid fire ant, S. invicta X richteri. Collins, H. L. and G. P. Markin. 1971. Inquilines and other arthropods collected from nests of the imported fire ant, Solenopsis saevissima richteri. Annals of the Entomological Society of America 64: 1376-1380. Frank, J. H. 1977. Myrmecosaurus ferrugineus, an Argentinean beetle from fire ant nests in the United States. The Florida Entomologist 60: 31-37. Lago, P. K., A. E. Zuccaro Jr., and S. Testa III. 2002. The terrestrial Coleoptera of Point Clear Island and surrounding marshlands, Hancock County, Mississippi. Journal of the Mississippi Academy of Sciences 47: 197-209. Tschinkel, W. R. 1992. Brood raiding the fire ant, Solenopsis invicta (Hymenoptera: Formicidae): laboratory and field observations. Annals of the Entomological Society of America 85: 638-646. Figure 1. Dorsal view of Myrmecosaurus ferrugineus.